It’s finally hit me: a breakfast slump. Sadly, it hit several weeks back and I’m just now addressing it. Admittedly, this is new for me. I typically wake up very hungry and don’t limit myself to breakfast foods, so the options are endless. But since the slump, there is little appeal to the usual suspects, and I seem to have lost ideas, too. What’s a girl to do? As busy moms, Stacey and I both know the importance of having quick, available meal options. We also understand the challenges in making meal prep a priority so that said meals are ready when needed. But a slump…I just wasn’t sure where to begin. Here’s my Taking Back Breakfast Plan in 5 simple steps. Acknowledge the slump. No guilt, just an observation of current status, and an opportunity to make improvements. Reflect on past breakfast choices in terms of what works given time and appetite. Don’t shame yourself into having blueberry pancakes if you have 10 minutes to eat. This is about doing what works, and convenience often wins in the morning. Turn to trusted resources for inspiration, (for me, these are food blogs, cookbooks, friends, and family). Think you don’t have any resources? Dust off whatever cookbooks you have at home, find one at the library, or easier yet, start searching the interwebs right now! Collect ideas and get organized. I noted some new menu ideas in a notebook and then added the needed items to my store list with the goal to begin incorporating new options as soon as possible. One of my choices was freezer breakfast burritos (see recipe below), which were simple to prepare but certainly more time consuming that pouring cereal into a bowl. Once I stopped procrastinating, they wrapped up quite well. Stacey has learned – with a newborn in the house – to keep hard-cooked eggs on hand. They can be enjoyed in tuna or chicken salad, and they’re also great for breakfast. Pop a couple of pieces of bread in the toaster, spread butter on top with a sliced egg and a little sprinkle of finishing salt. Add a side of tomatoes, watermelon, or another fruit to complete the meal. Enjoy breakfast again! It does set the tone for the day, so a slump can truly impact energy levels as well as eating in the hours that follow, so it’s worth it to make it count. In large skillet, cook 1 lb hot Italian turkey sausage per package directions until fully cooked. If sausage is in the casing, remove casing by slicing sausage lengthwise and peel off. In another large skillet, scramble one dozen eggs and season as desired. Add the cooked sausage and ½ cup salsa to the finished eggs. In each medium flour tortilla, use ½ cup worth of egg and sausage mixture for each burrito. Sprinkle with desired amount of Cheddar cheese, and roll up, with edges folded in. Place completed burritos on foil or parchment-lined baking sheet and place in freezer to set. Once set, wrap each individually in foil or plastic wrap and place in freezer bag. For reheating in microwave: lightly wrap burrito in paper towel and heat for1 ½ – 2 minutes on high. Cooking time is variable based on the microwave. 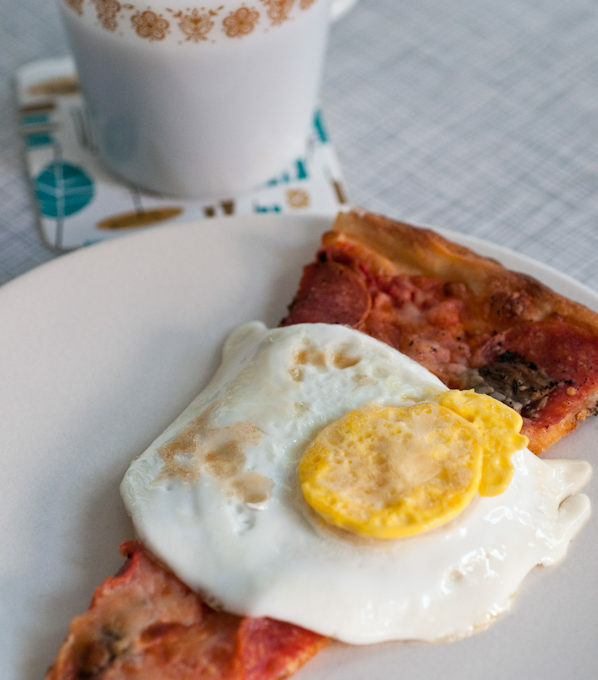 What are some of your favorite breakfast ideas? Where do you turn when a meal slump hits? Love the photo! It’s fantastic.